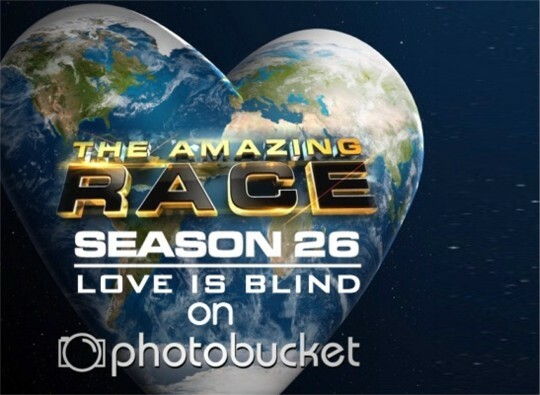 Recap: The Amazing Race 26, Episode 10 – "You're smarter than the other ones." The episode begins with more deleted Hayley & Blair scenes from the last Leg. They promise to both do better this Leg. Meanwhile, Laura & Tyler open the first clue of the Leg telling teams to fly to Trujillo, Peru. Plane tickets have been reserved for the teams and Laura & Tyler head to the travel agency to get their tickets which gets them into Trujillo at 9:25am. They are happy to have their tickets and decide to go celebrate Laura’s 30th birthday. But Hayley & Blair walk into the travel agency and ask if there are any earlier flights. And there are! The agent gets them tickets on a flight that arrives at 10:40pm the night before. Laura & Tyler laugh about not wanting to invite Hayley & Blair Bickerson to the party since they don’t want their negative energy around. They say this while Hayley (and maybe Blair) happily buy the early tickets. Laura & Tyler get to a bar as Jelani & Jenny get to the travel agent, also hoping to find earlier flights. Hayley & Blair tell them about Laura & Tyler not asking about earlier flights. Hayley & Blair and Jelani & Jenny head to the airport and leave Amsterdam. A buzzed Laura & Tyler get to the airport and realize they’ve messed up. After 22 hours of traveling, Hayley & Blair and Jelani & Jenny arrive in Trujillo and head to Plaza de Armas where they will have some fun in the fireworks festivities. They receive a matchbox with a 7am departure time. Next morning, they receive the next clue pointing them to “a shine in the morning sun” in Plazuela de la Merced. The two teams ask a taxi driver where it is, but he says it’s too dangerous to walk there. Both hop into taxis, but neither driver knows where to go. Jelani & Jenny decide to head back to Plaza de Armas since they believe it was supposed to be within walking distance. And they find the next clue at a shoe shiner. Teams must take a taxi toward Santo Domingo then Fundo San Fernando on the way to Cuartel No. 1. Jelani & Jenny are on their way, but Hayley & Blair are lost. Hayley tells Blair they need to head back where they came from, but Blair insists on waiting here as the taxi driver is doing… something. Hayley is again frustrated by Blair not listening to her. They end up going back to where they came and they finally find the shoe shine stall with the clue… which is where Hayley wanted them to go in the first place. 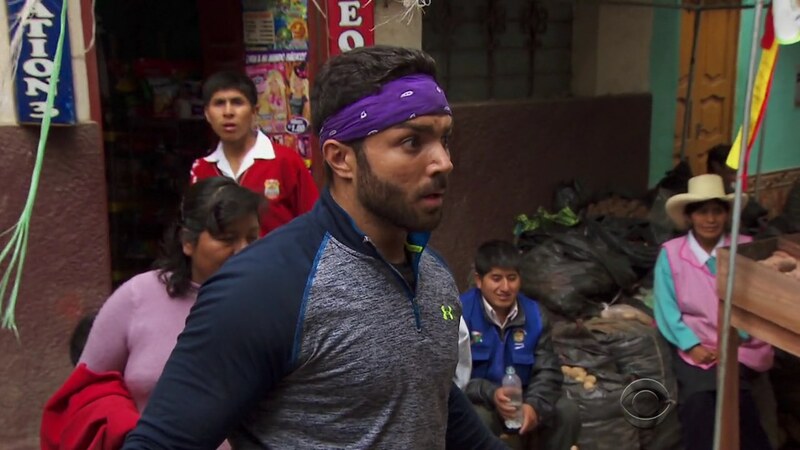 As the trailing teams arrive in Trujillo, Jelani & Jenny arrive at the next clue which reveals the Road Block, Who wants to take charge in the field? For this Road Block, teams will help harvest a section of a sugarcane field by hand. When finished, they’ll get a bundle of sugarcane and their next clue. Jenny decides to do the Road Block. Back in the city, the other teams are searching for the “shine in the morning sun.” Laura & Tyler see llamas and typewriters, but no cluebox. They then run right by the shoe shine stall and the big Speed Bump sign with Matt & Ashley’s picture on it. A local tells them the location is far away, so they have to grab a taxi. They tell Matt & Ashley the same and they both leave. But Mike & Rochelle find the clue and head off. Laura & Tyler wonder where the first clue is since they think the llamas and typewriters are the Detour. Laura says she even saw the Speed Bump, but no clue. Tyler says the clue is always next to the Speed Bump. They head back. Matt & Ashley also realize their mistake and turn around as well. Meanwhile, Hayley & Blair arrive at the Road Block and Hayley decides to do it. She is happy to be able to take her frustration out on the sugarcane, while Blair wants to stay far away for fear of getting caught by Hayley’s machete. Laura & Tyler finally find the clue and Matt & Ashley find their Speed Bump. 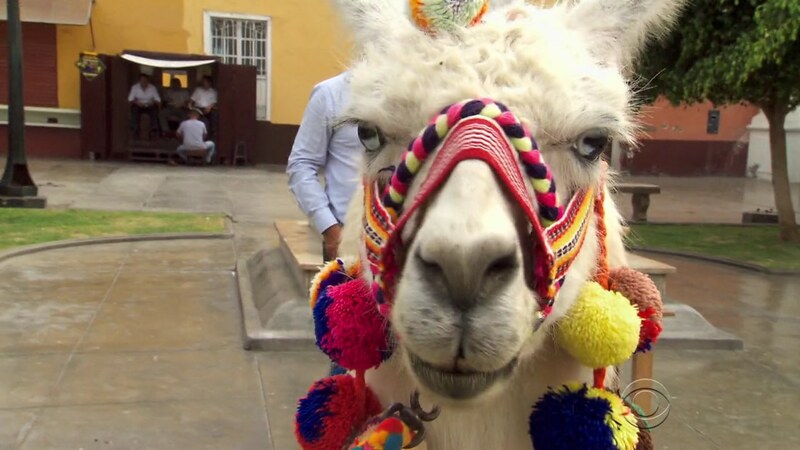 For this Speed Bump, Matt & Ashley must use a typewriter to fill out a llama loan application. Ashley has no problems working the typewriter, but Matt is having trouble keeping up. Over at the Road Block, Jenny finishes and gets the next clue directing teams into the Andes and Parque Ramon Castilla where they will deliver the sugarcane. Before they hop back into the taxi, they must write down their number of steps and calories from their Fitbits onto a provided card which they will refer to later. Hayley & Blair are close behind. Matt & Ashley finish their Speed Bump as Mike and Tyler start the Road Block. Over at the stadium, Jelani & Jenny find the next clue. 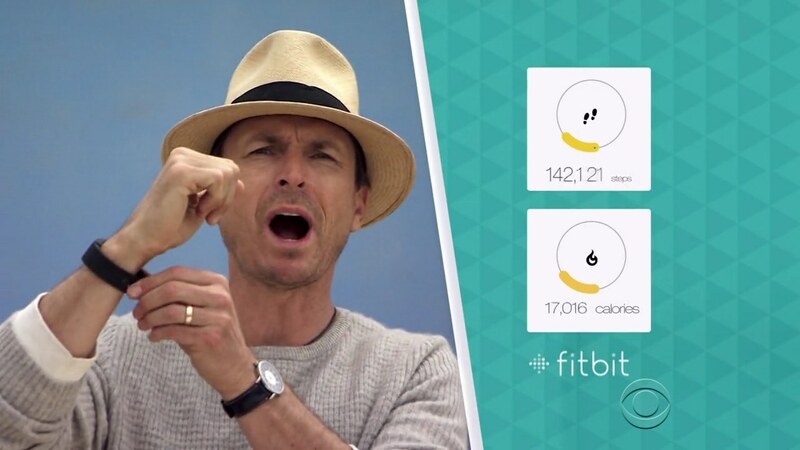 Teams have been using Fitbit Charges since the beginning of the Race. They must now use the data they’ve collected to calculate how many steps it would take to burn off the calories from a glass of sugarcane juice which will be made from the sugarcane they’ve just delivered. Hayley & Blair catch up and Hayley is excited about doing math. Laura & Tyler and Mike & Rochelle leave the Road Block just as Matt & Ashley arrive. Matt does the Road Block. 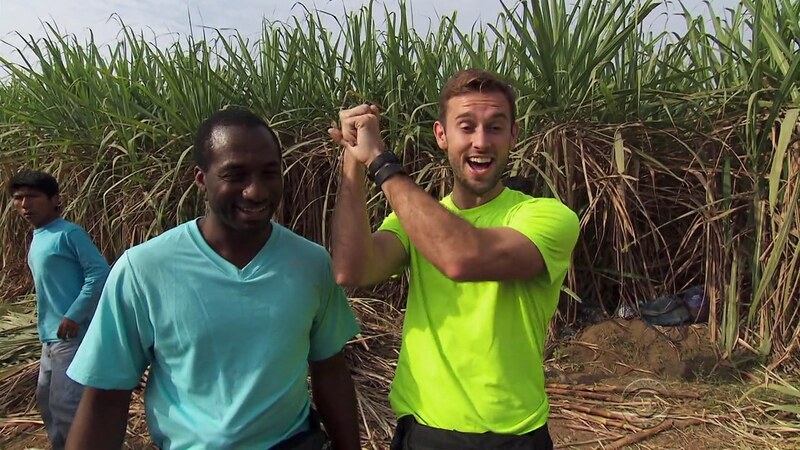 Jelani & Jenny and Hayley & Blair drink their sugarcane juice and receive the next clue revealing the Detour. 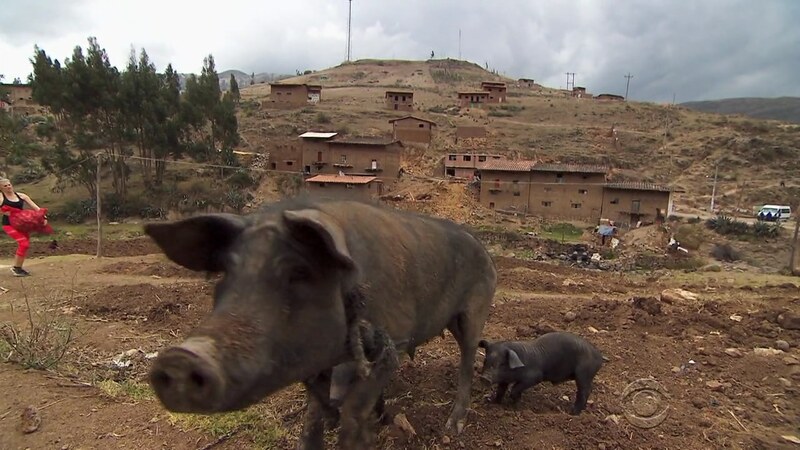 In Mamas, teams will be given a list of ingredients for Mama Mecha’s 70 year old chicha brew, a type of Peruvian moonshine. They must search the streets of Otuzco for the ingredients and deliver them to Mama Mecha for a glass of chicha and their next clue. In Papas, teams will head to a potato farm and sort a pile of potatoes into separate sacks by type. They will then be taken by motor taxi to one of the marked stands in the potato market where they will place the each variety of potato in their own bin. Once they’ve correctly sorted the papas, they’ll get the next clue. Jelani & Jenny choose Papas while Hayley & Blair choose Mamas. Blair’s Spanish skills are of great use to them searching the market for ingredients. Jelani & Jenny sort the potatoes and load them onto the motor taxi to the market. They place the potatoes into the bins, but they’ve mixed up a few of them so they get the thumbs down. Not only that, but the bins are opened and the potatoes roll out all over the ground. Hayley & Blair, meanwhile, deliver the ingredients to Mama Mecha who gives them a drink of chicha and their next clue which points them to the Pit Stop, the Virgen de la Puerta. Hayley & Blair run to the Mat and officially check-in as Team #1. They win a Fitbit kit which includes either home workout equipment or a 1 year gym membership plus every single Fitbit product, a laptop and a cell phone of their choice. Phil says they look so friendly and happy now and both Hayley & Blair say they respect each other. They’re #BFFs even if Blair wants Hayley to shut up sometimes and Hayley wants Blair to listen sometimes. Jelani & Jenny finish re-sorting their papas and they finally get the thumbs up. They run over to the Pit Stop to finish as Team #2. Laura & Tyler chose Mamas, but their driver takes them to the Papas. Frustrated, they reluctantly decide to do the potatoes Detour instead. But they do not sort the potatoes before scooping them into the sacks. Instead, they sort the potatoes at the market while placing them in the bin. They use water and their spit to wash the potatoes to make them easier to distinguish. Mike & Rochelle choose Mamas and have no problem looking for the ingredients and stores. They end up as Team #3. Matt & Ashley also choose Mamas and are taken to the market, but they walk right by the store where they pick up the ingredients list. They pass Laura & Tyler who tell them the driver must have taken them to Papas too. So Matt & Ashley hop back into the motor taxi only to be driven away to the potato field. They can’t believe it, but they have to do it. Laura & Tyler’s papas are approved and they head to the Pit Stop to check-in as Team #4. That leaves Matt & Ashley at the potato bins, shocked that the lady just dumped all their potatoes on the ground. They fix their mistake and head to the Pit Stop where Phil officially eliminates them. I thought this was actually one of the best episodes and Legs of the season! 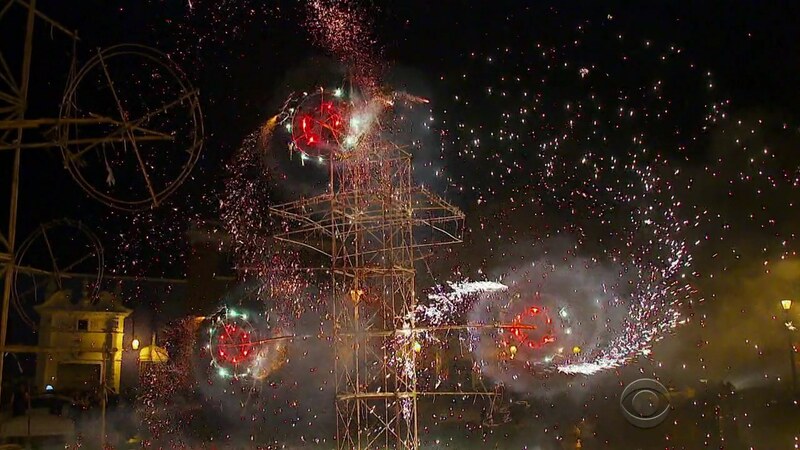 The episode was very full and was exciting from the start. The “You can’t buy new tickets” rule has been so-so so far, but this episode showed how buying plane tickets is still a big part of the Race. Providing them tickets they don’t have to use if they don’t want is great and, as Laura & Tyler showed, this is still The Amazing Race. So that means teams still need to have good traveling skills. The clue riddle with the shoeshine stall was great. And it definitely provided some big drama as we saw. The Road Block was awesomely physical. And having them take the sugarcane with them to the next task was good. The Fitbit task was perfectly fine. Again, product placement is not a bad thing. 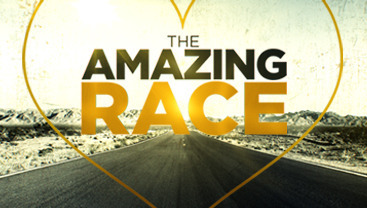 Especially for The Amazing Race which definitely needs all the corporate sponsorships it can get. The Detour was good. Shopping for ingredients is a TAR staple, but it was great to add Mama Mecha as well. The potatoes were also a typical TAR task, but the traveling with them and then having them get dumped out added to the excitement. I also like seeing teams criss-crossing each other while doing the Detour tasks. Jelani & Jenny had a good Leg, helped very much by the early flight of course. But they’ve become what Laura & Tyler were in the early Legs. They’re all business. No love connection, but they’re very competitive. And they don’t need to be cocky or put other teams down to do well. Mike & Rochelle are continuing to do just well enough to move through. Again, they’ve made it to the penultimate Leg. It would be awesome to see them step up and make a move. It was great to see them, calmly, do well with directions and all the tasks. That might be what gets them ahead, actually. Matt & Ashley missed a huge opportunity. They had every chance to survive this Leg, but they just had to go and listen to Laura & Tyler, twice, and they get eliminated. They could’ve easily done their Speed Bump in the time Laura & Tyler were driving away from the clue. Then they could’ve easily finished the Mamas Detour while Laura & Tyler picked their potatoes up. It’s too bad. Matt’s hilarious mini-meltdowns have been great and Ashley has also held her own as well. I wish TAR gave them a little more story in the first few Legs though. Laura & Tyler had an epic meltdown this Leg. That doesn’t bode well for the Final Legs. Should be interesting to see if they have anything to be confident about moving forward. Though I did enjoy their obliviousness to the Speed Bump and the shoe shiner. ← Recap: Kamen Rider Drive, Episode 27 – What Is Go Shijima's Reason to Fight? When are you going to make your season wrap-up for TAR 26 as well as your recap for the last two episodes?